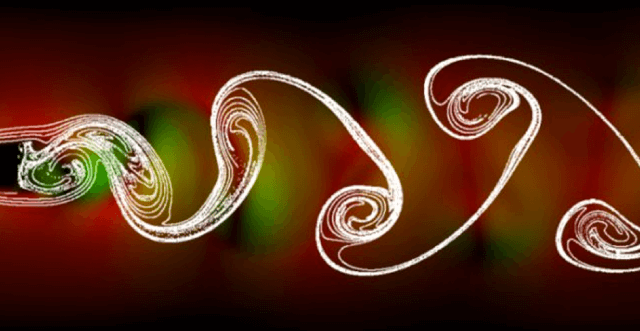 Fish swimming in front of a structure display lower tail-beat amplitudes and body wave speeds, implying that the bow wake may be the most energetically favorable region for a fish to hold position near a large rock. A sandy bottom, like the one in the first diagram, causes very little disturbance to the flow of water and has a very shallow zone above it. Steelhead will move over an area like this, but there is no incentive for them to hold here for an extended period of time, since they would have to exert energy to stay here. 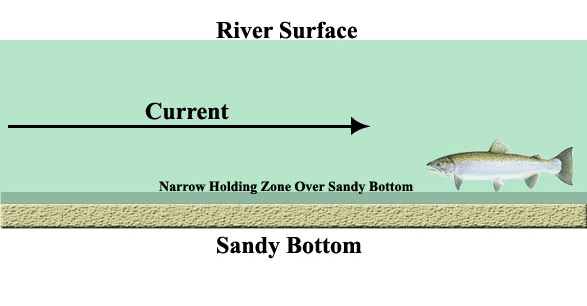 A bottom made up of rocks, however, creates more disturbance in the water and results in a much wider zone of reduced current along the bottom. The bigger the rocks, the deeper this area of turbulence will be along the river bottom.